I am using the Field Timer module to display countdown timer on my article node. This module will take the value of the date/time field (field_article_datetime) and convert it into a countdown timer in the display of the article. When the article node is created, I want to set the value of the date/time field (field_article_datetime) equal to current time + 5 minutes. To extract the current time, I am using the token [node:created] from the token module, but I cannot find a solution on how to add +5 minutes to the token [node:created]. This way, the user will see a countdown timer for 5 minutes on the article node display page. 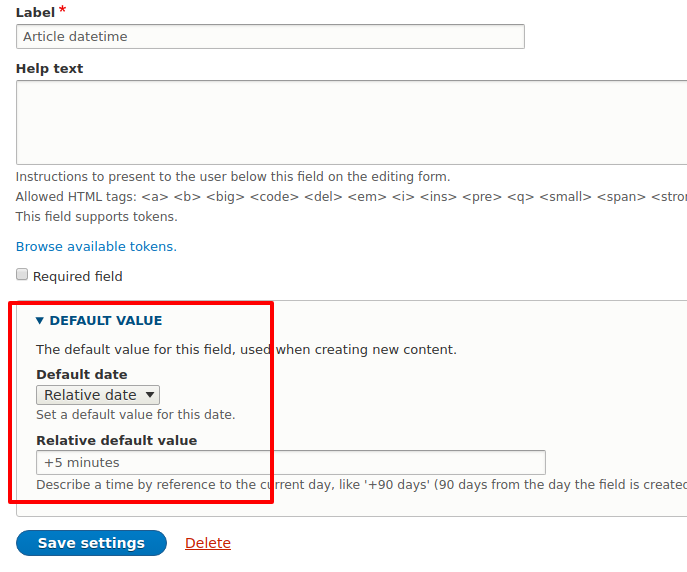 Note: I am using the Business Rules module (similar to Rules module) to set the value of the date/time field (field_article_datetime) with the help of the token module. Update #1: Say the node is already created on the site and I want after the submission of a webform to fetch & update the node with update time + 5 minutes. Fetch the article by nid. Set the value of field_article_datetime equal to: updated time + 5 * 60. Since the above actions will be triggered when a user will submit a webform, so why not create a customwebformhandler.php file. * Update a node entity from a webform submission. // Fetch & Update node object from webform-submission. // contains the node ID of the node to be updated. // This is the part where to fetch the node by the value of (update_nid) element. // This is the node Updating part. // This is the node Saving part. If the above is not good enough you can probably use hook_entity_presave to adjust the time to be EXACTLY the creation time +5 minutes. NOTE: if you want to update the timer even on node update you can just delete the && $entity->isNew() part. Not the answer you're looking for? Browse other questions tagged 8 datetime tokens or ask your own question. How to format a date submission value of a webform? How set a time type field programmatically? How do we make the date field default to today's date? How do I use a token to set the default value of a date field to the current date?